Behind the Bit: Talk about an All-Rounder! A few days ago I posted the WEG X-country helmetcam footage of Peter Atkins and Henry Jota Hampton (aka Henny). It was a wild ride, but they did great on this looong, scary course. They were 24th in the final standings, not too shabby! And you can see from the dressage photo that they're a striking and elegant pair in the dressage ring. More recently Henny competed in the Myopia Hunt / Putnam Boston Jumper Classic -- um, in the lead line class. "We headed down to Hamilton for the Myopia Hunt / Putnam Boston Jumper Classic this weekend. 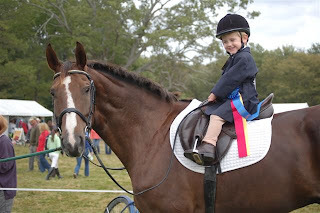 Owen rode Henny in the lead line, they won of course!!! So did the other kids. He was of course the crowd favorite and Henny was best behaved of all the ponies." Not that is one exceptional horse! Go, Henny, go!! Gotta love'em. Now THAT'S a good horse! That is so cool! I love that a 4* horse can be gentle enough for the lead line class, not to mention Owen can say he's ridden a 4* horse before he was 10, no big deal! Precious duo! I can almost hear the young rider chanting "Henny!" 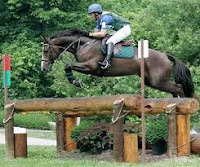 ....there's just something about this horse that inspires good "all round" feelings and to think he goes from a top level eventer to toting around little-cute-as-a-button Owen in a leadline class; well, how cool is that! If you're a Peter & Henny follower, you no doubt have seen other pictures of Henny and Owen. They are the BEST of friends. On Peter's Facebook page, there are many pics of the adorable pair at WEGs. My two favorites are a pic of Henny's stall with a drawing from Owen of a horse and it says "I love Henny" (awwwwwww!) and another picture of Owen holding Henny for the farrier. Its just amazing that Henny can be at peak fitness for WEGs, yet still be so quiet and docile for his little friend Owen. Peter and his wife must be so proud of both "their boys". And I'll say again what I have been saying for months... Someone needs to write a children's book about Owen and Henny!! I'm not creative enough, but it would be a great way for Peter to raise money. I got to meet Peter Atkins last Saturday and a hog roast at the stable where I take lessons. He was doing a clinic (that I could not attend) but got to hang around and listen to him some, very cool! Owen and Henny - now that is one heck of a pair! LOVE that picture of the two of them while Henny is standing for the farrier. Just an AMAZING horse...and Peter is just fabulous! That. Is. So. Cute. Cute horse, cute boy, all around cuteness!!! !